Sometime during the summer, we get an email reminding us to check out our back-to-school supply lists on our school website. These lists always contain very specific items that our teachers are requesting for the school year. Sometimes I find the lists amusing – for example, Zachary’s list requests a box of 16 Crayola crayons and it is specified that the box should be no bigger than 16 crayons. Gabbie on the other hand, needs a box of 48 crayons. I happen to have two unused boxes of 24 crayons, so technically I can’t send these in with either kid! Also, Gabbie’s list requests a “zipper-closure 3.5” expansion folder called Wallet with Divider.” I have no idea what this is! A trip to the store to find the remaining items we need is on my to-do list! While I might find our lists amusing and I may complain about the process of shopping for school supplies, I am actually happy to help out our teachers, especially knowing that on average, teachers spend $1,000 of their own money just to make sure their students have the resources they need to learn. Since Great Clips is all about GREAT, they have teamed up with AdoptAClassroom.org, an organization that helps deserving teachers while giving families a place to address their back to school needs. Great Clips has already fulfilled two teachers’ lists and you can watch their video of their classroom makeover. Right now, with every download of Great Clips’ Online Check-In app, Great Clips will contribute to AdoptAClassroom.org (up to $20,000) to help continue to support teachers and students. The Online Check-In app lets you add your name to the waiting list at your local Great Clips salon. Many Great Clips salons are offering back-to-school pricing for haircuts! This app is great because it benefits both families and teachers getting ready to go back to school. Not only that, you can upload your own back-to-school supplies list for a chance to win! Every day, one lucky winner will get their school supplies bought and shipped to their front door for free, up to a $100 value! 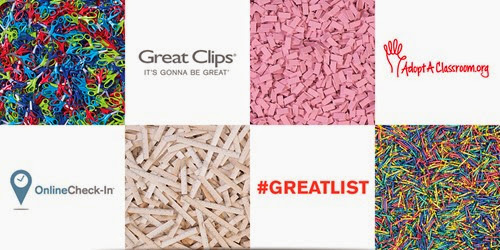 #GREATLIST contest entrants receive a $2-off Great Clips coupon with their confirmation email the first time you submit a school supply list. Full contest details can be found here. Teachers surely know that any donation of money or supplies can go a long way to support their classrooms. What little we can do to help is surely appreciated! Have you done your back-to-school supply shopping yet? This post is sponsored by Great Clips, but all opinions are my own!